What is your antivirus talking about? One thing fire safety and information security have in common is that most people don’t bother preparing and then panic when something happens. But if something goes wrong, you need to act fast — and get it right — so that everything turns out fine. That’s why it’s good to know what your antivirus is saying when it encounters this or that threat. Consider this post a cybersecurity fire drill. By the way, for this kind of situation we have a test file designed to be detected as a threat by antiviruses. The file is completely harmless; it was specially designed for this sort of drill. The first thing to pay attention to in notifications shown by your security solution is the color of the frame. 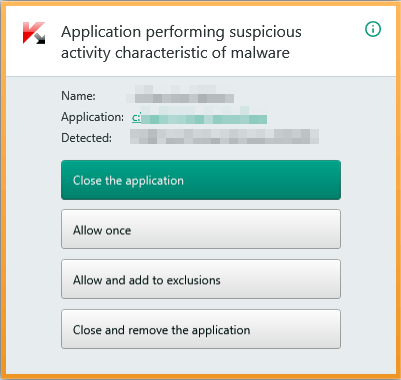 A red frame means stop everything: The antivirus has found something really dangerous. 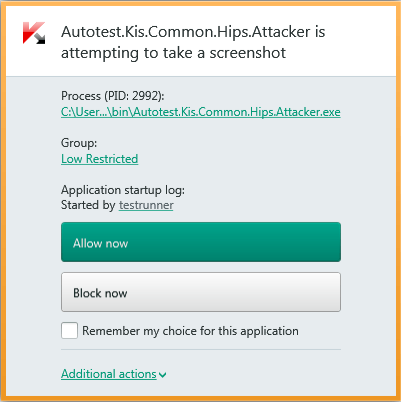 For example, if Kaspersky Internet Security shows you a notification that looks like the one in the screenshot below, don’t take any chances. Follow the program’s advice. In this case, Kaspersky Internet Security will offer to cure an infected file or application if possible. 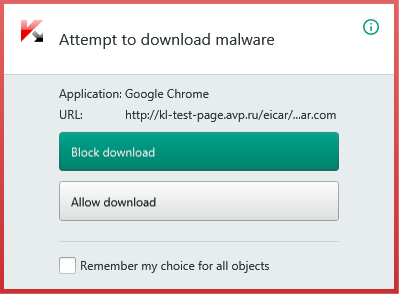 If the antivirus detects a dangerous object on a website that you have visited, it’s probably best to navigate away from that website. Not all downloaded applications are safe. If you see a message like the one below, cancel the download. A legitimate application may attempt to do something dangerous, too. 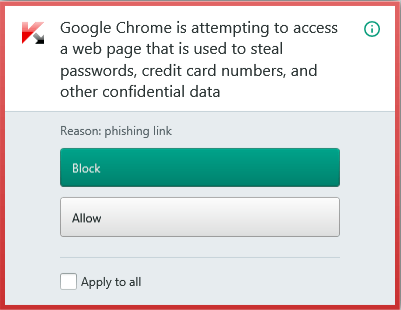 For example, a browser may try to open a phishing link. Block that attempt. 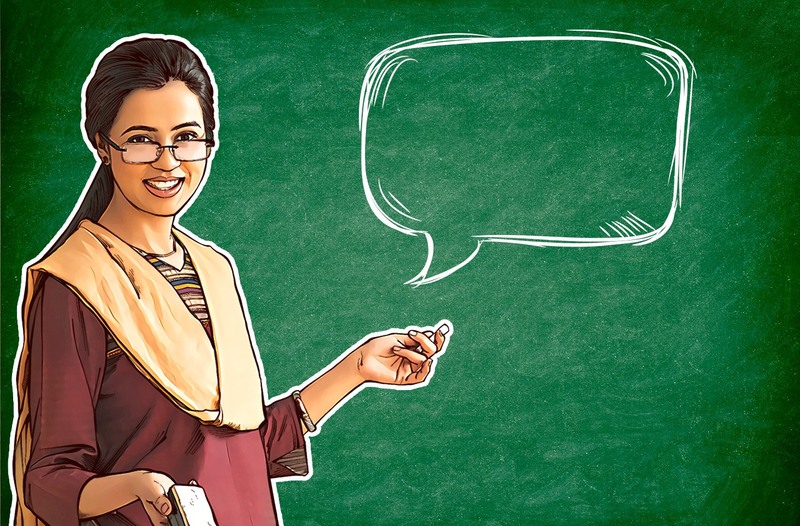 Generally, messages with a red frame indicate that something malicious is threatening you. An important exception to that rule is the confirmation of risky user behavior. For example, disabling automatic updates is not immediately dangerous but is likely to lead to trouble in the future. If Kaspersky Internet Security cannot download information about the most recent threats, then it may not protect your computer against new threats. That’s why notifications about outdated databases are also marked with a red frame. If the frame is orange, then something isn’t right. 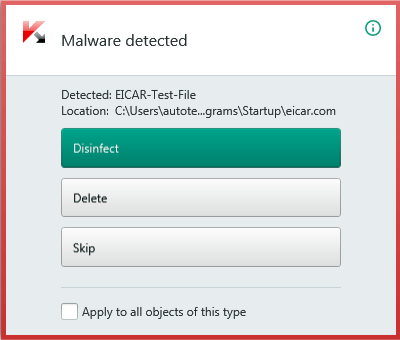 For example, the antivirus may have discovered an application that is behaving suspiciously. This would be a good time to give it some attention and thought. 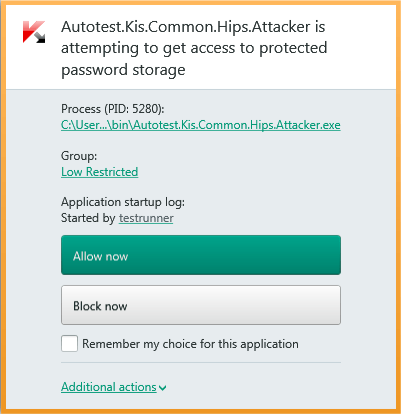 If you have been working with the application for a while, if you trust it and really need it, then you can add it to the list of exclusions, and then Kaspersky Internet Security will not bother you about it again. Still, keep a weather eye open; the orange frame may also be an indication of danger. Many applications are not threats by themselves, but they can be exploited to steal your personal data. Carefully read such messages and the application names indicated in them. If you are not working with those applications at the moment or if you do not know what they are at all, then select Block now. If you see a message with a green frame, then you are not in danger. 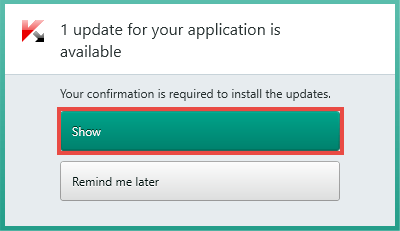 A green-framed notification is usually along the lines of a confirmation needed to update an application. Such notifications are still important — updating applications that are installed on the computer improves performance and security — but there’s no need for alarm. You’ll find detailed articles and video tutorials on how Kaspersky Internet Security works in our Knowledge Base.